This leafy, aspirational village evolved from a poor man’s Georgetown to inspirational, laid-back enclave with an artistic bent. Burleith is a village between Georgetown and Glover Park comprised of 535 residences. A place where trees and people grow. Lounge in Ellington's big green chair. Let the mutt and kids off-leash at Guy Mason Rec Center. Bring a basket to the annual summer picnic. See the leaves frame your home in vivid autumn colors. Gulp a mug at the annual gløgg party. Marvel over autumn leaf colors. Shop the farmer’s and flea markets. Meet someone new at the “Social Safeway.” Walk the pooch under a canopy of trees. Make your mark on the neighborhood. Perhaps not in cement. Kick back on the porch with an iced tea and share sage advice with passersby. Throw a deck party. Plant bulbs. Get into the neighborhood spirit with holiday yard displays. Run a few laps at Duke Ellington Field. Fly a kite. Watch your Burleith equity grow. Life is good when you’re not house poor. Why should you care about Burleith real estate market data? Because it's the measure of your investment over time! Burleith was built on elevated ground, so its temperatures were slightly cooler than those in most areas of the city. 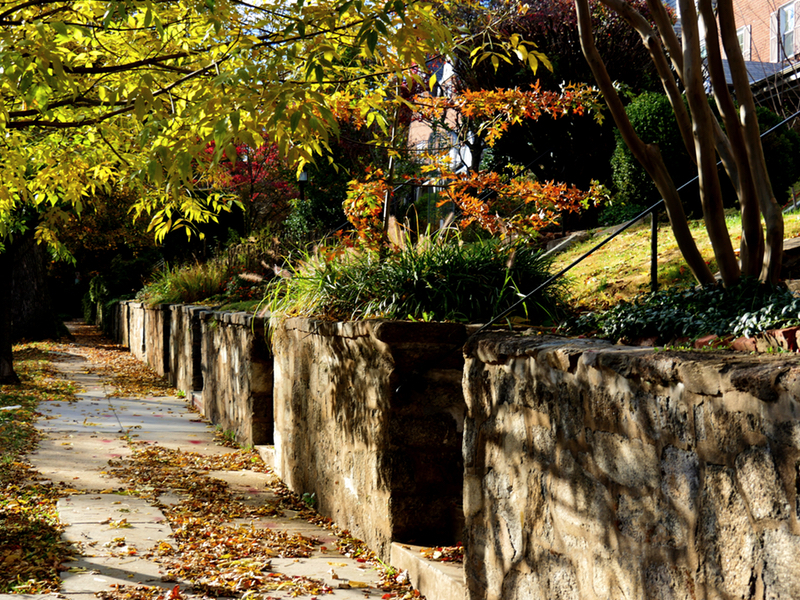 Charles Dickens put it this way in 1842: “The heights of this neighborhood, above the Potomac River, are very picturesque; and are free, I should conceive, from some of the insalubrities of Washington. The air, at that elevation, was quite cool and refreshing, when in the city it was burning hot.” Developer Frederick W. Huidekoper purchased the Burleith tract in 1886, erected a few buildings, kept most of the land intact and subdivided it. Huidekoper is said to have filled the “lake” at the intersection of what is now 37th and S Streets with 3,200,000 cubic yards of dirt because of the amount of water that poured down the ravine near T Street when it rained. The work was completed before Huidekoper sold the subdivision to Shannon & Luchs. Shannon & Luchs decided in 1923 to develop housing for “the buyer of moderate means, but of more than ordinary good taste.” Their 1926 promotional brochure touted the “ideal location” of Burleith as “adjacent to historic old Georgetown,” and proximity to “two great educational institutions: Georgetown University and the Convent of the Visitation” as well as “the magnificent estate of the Archibald family.” The publication also promoted “tracts recently purchased by the U.S. Government for purposes of forming a connecting link between Glover-Archbold Parkway and the Rock Creek Park system.” (Whitehaven Parkway, the three-block northern boundary of Burleith, was never built through, although sections of Whitehaven are found between Macarthur Blvd. and Foxhall Road, and near the British Embassy on Massachusetts Ave.). Shannon & Luchs built approximately 450 homes in Burleith between 1923 and 1928. Most offered six rooms. Their architectural style is primarily ‘American Colonial’ utilizing brick in a variety of colors, accented by stone, wood, and plaster. Machine-made trimmings and moldings could be ordered from a catalogue. The price of the Burleith homes ranged from $8,950. to $13,500. and tempted buyers with features and finishes typically found in higher-end residences. These included hot water heat, ‘real’ floors and plaster. An additional block of new homes in Burleith was added in 1928, by Cooley Brothers. They built Tudor-style row houses on the north side of T Street between 38th and 39th. Few homes had been occupied when “the Great Burleith Fire” destroyed seven of the new homes on 37th Street. Efforts to put out the fire were hampered by the subdivision’s own construction on S and T Streets, which blocked fire extinguishing equipment.